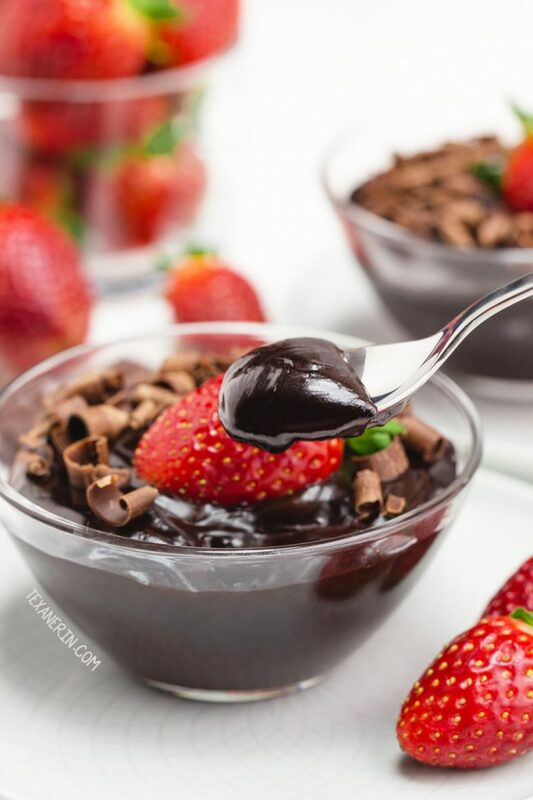 This vegan chocolate pudding is also paleo but you’d never know it! It’s super rich, tastes like regular pudding and is coconut sugar or maple-sweetened. Like I mentioned in my last post, these peanut butter oatmeal bars, I finally have some new recipes ready to go. 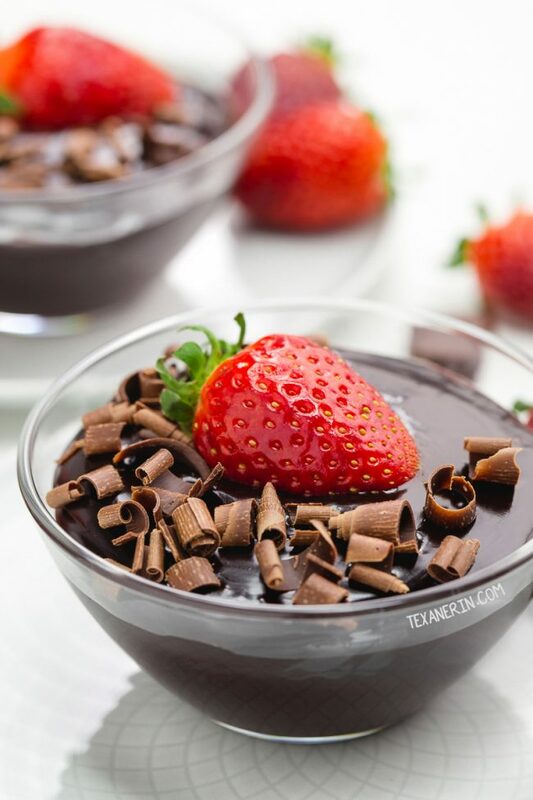 And this paleo chocolate pudding is one of my favorites! 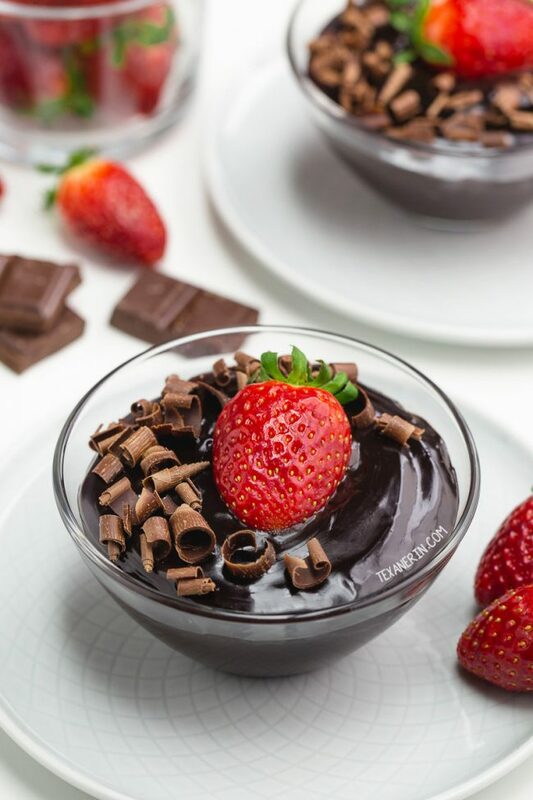 I’ve posted some other healthy pudding recipes like this chocolate raspberry pudding and this chocolate peanut butter pudding, but this time I wanted regular pudding! Without avocados, dates or bananas. Mr. T referred to today’s recipe as “as good as grocery store pudding.” It’s a huge compliment from him because boxed pudding is one of his favorite things. He thinks the no-cook kind totally fascinating. I think, and I’m guessing a lot of you would agree with me once you try it, that this pudding is way better than store-bought pudding. It doesn’t taste the least bit healthy (or, well, this isn’t really healthy but it is made with what I consider healthier ingredients) and doesn’t taste coconutty, either. He also kept suggesting I use this pudding in other recipes. But I have no idea what! Maybe to fill cupcakes? Anyone have some ideas? Something else he wanted to do was add booze to it. This pudding is so thick you could probably add a few tablespoons after it’s cooked (which would also de-paleoify this pudding). Or you could not use the full amount of coconut milk (maybe 2-4 tablespoons less, depending on what kind of alcohol you use) and then add that amount after it’s cooked to the pudding. Like a lot of my recipes tend to be, this pudding recipe is super thick and rich. Light desserts aren’t my thing. If you’re like me, check out my vegan chocolate ice cream or paleo chocolate cheesecake some for more ultra decadent chocolate desserts. Since this vegan chocolate pudding doesn’t have dates or bananas, it’s got quite a bit of sweetener. Like 1/2 cup. But it yields 2 cups of pudding and given how rich it is, I think saying that it’s 4 servings is reasonable. Two tablespoons of maple syrup or coconut sugar for some insanely delicious pudding doesn’t seem that bad! I remember seeing a cupcake recipe once that had 13 tablespoons of sugar in each cupcake. I’m sure it was delicious but holy moly. So much sugar! Questions about this vegan chocolate pudding? Canned coconut milk is somewhere around 24% fat, which is way more than almond or any other kind of milk. So I don’t think any kind of milk (dairy or non-dairy) would work. For a non-vegan and non-paleo version, you could use whipping cream, which is around 30% fat. I’ve only tried this chocolate pudding recipe with maple syrup and coconut sugar. Both resulted in a totally normal tasting pudding (meaning there was no aftertaste). Honey would work for a non-vegan version. Whether or not you’ll be able to taste the honey depends on what kind you use, as well as what cocoa powder you use. So if you use honey, keep in mind that you might be able to taste it a bit. You can use any kind of unsweetened cocoa powder. I used Dutch-process because I like the dark chocolaty taste but natural cocoa powder (like Hershey’s) or raw cacao powder will work, too. But I highly recommend Dutch-process. :D.
You could use a combination of canned coconut milk and almond milk. I think maybe use all but 1/2 cup of the canned coconut milk and use almond milk in its place. I haven’t tried it but that’s my guess! Can I make this thinner? Use 1 tablespoon of arrowroot instead of 1 1/2 tablespoons. Also see above. This tastes 100% like regular pudding (at least it did with the coconut milk and cocoa powder I used). I would say the difference is that this is richer and a bit thicker. Add all except about 1/2 cup of coconut milk to a small saucepan. To the pan, add the cocoa powder, maple syrup, vanilla and salt. Whisk together, turn the heat to medium and continue to whisk occasionally. Meanwhile, mix the remaining 1/2 cup coconut milk with the arrowroot starch in a small bowl until well combined. It may appear lumpy at first but keep stirring and it'll combine. As the mixture on the stove starts to get hot, whisk more frequently, making sure it doesn't burn or clump together on the bottom. Once it starts to bubble, whisk in the arrowroot and coconut mixture while stirring constantly. Whisking constantly now, cook until thickened. Do not walk away and do not stop whisking! This will take 1-10 minutes depending on how hot the mixture was before adding the arrowroot. Do not let it continue cooking more than one minute after it's thickened - this can cause the arrowroot to break down and will make the pudding runny. It'll thicken a little more once chilled. Let cool until room temperature, stirring frequently so that a skin doesn't form, and then refrigerate in an airtight container. Garnish immediately before serving. 29 comments on “Vegan Chocolate Pudding (paleo, dairy-free)” — Add one! This looks so amazing! What a beautiful decadent dessert! You’re welcome! I’m really happy that you found a pudding recipe that works! And I’m so glad that you liked the specific instructions. :) I always hate unclear directions when I make recipes! Thanks a bunch for your nice comment and sorry for my slow reply. Now this is decadence! And I must know how you made those chocolate curls so perfect! they never work out that great for me. Can I substitute tapioca starch for arrowroot powder? Yes, you can! I made it that way recently. My fiance and I absolutely LOVE this recipe, and it’s so simple! I’ve been trying to find a coconut whipped cream to add on top but I’m not having any luck finding a good brand of coconut cream or milk to work with. What brand of coconut milk or cream do you use? Hi there! Sorry for just now seeing your comment. I’m so happy that you love the pudding. :D I live in Germany and use a store brand so I’m afraid I’m no help. Sorry I can’t be more helpful! Almond milk worked just fine for me. I’m allergic to coconut. I’m happy that it worked well! Was it nice and thick still? Thanks for your feedback! Will there be a noticeable increase in thickness when it’s done? I whisked for 11 minutes while it bubbled, and I never noticed much of a change. Hopefully it will thicken up as it cools. Thank you! You should notice a noticeable increase after you add the arrowroot starch mixture but no increase in thickness before that. Did it work out? This looks incredible! Love how thick and rich it is! Wow! Drooling over this! Perfect! I have a sweet tooth now! This looks amazing! 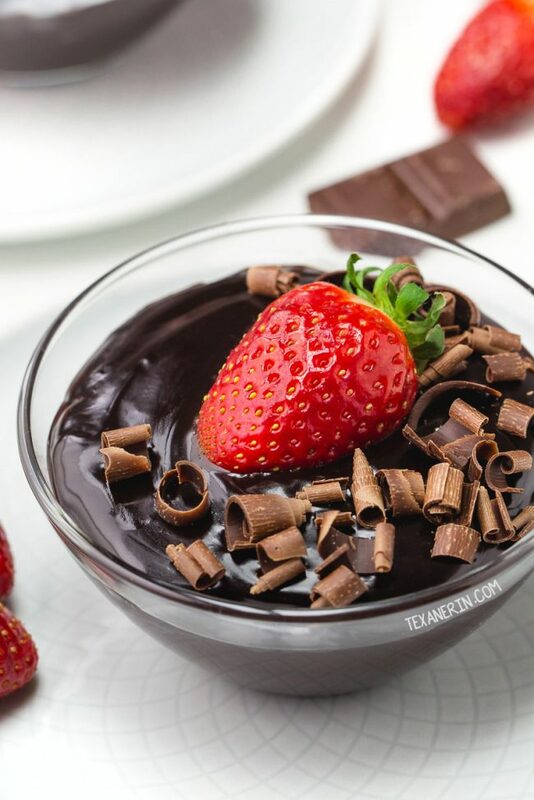 This pudding looks so silky and delicious! My kids will love it! That looks perfect and I love the addition of the maple syrup! What a delicious treat! I love that you used coconut milk! This looks so rich and chocolatey! I need this in my life right now! Yum!! You’re welcome! I’m so happy that you liked it. :) Thanks a bunch for your feedback! YUM! This pudding looks absolutely delicious! So easy to make too! YUM!! Looks thick enough to dip strawberries in. HA! This is a perfect dairy-free alternative to pudding! I love how rich, dark chocolate it is…can’t wait to try the recipe! !